Once upon a time, in a land far far away, a shiny accordion of colossal proportions lay in its heavy leather case in the living room of a grand house. 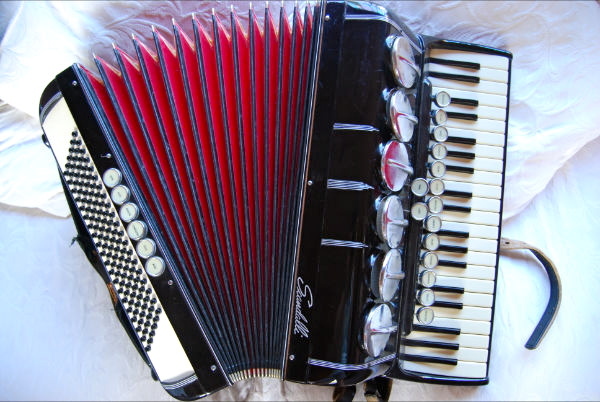 The accordion was often loved and cared for by its original owner, Mr Giovanni Menegazzo (known amongst friends as Jack), who would pick up his accordion with pride and play entertaining melodies on its keys and buttons. This was Nonno Jack. A handsome man indeed. Over time and after the passing of its original owner, the accordion lay locked and secured in its case, waiting for that next breathe of air to be blown into its bellows. It was many years and a couple of generations later when finally a curious, piano-playing, sixteen year old discovered a large black box covered in a thick film of dust in the depths of the household. After clearing the fine powder, she cracked the rusted locks and opened the lid to reveal an instrument in fine condition. Being able to play the piano, the curious girl carefully lifted the accordion from its velvet-lined case and swathed her shoulders around its straps, letting the significant weight rest on her lap. Her slender arms reached around its body, positioning the hands on its keys. The left hand was unsure where to place itself. The instrument itself was not unfamiliar to the girl for she had grown up seeing older gentlemen at functions and family events playing a much smaller version. All it seemed one had to do was open and close the bellows for the keys to make a sound. It was necessary for a large degree of effort to be exerted to create substantial noise from the large accordion, something the young girl struggled with. However her determination was stronger than her initially feeble attempts and within time she was able to construct a simple song together with the inherently Italian-sounding notes booming throughout the house. 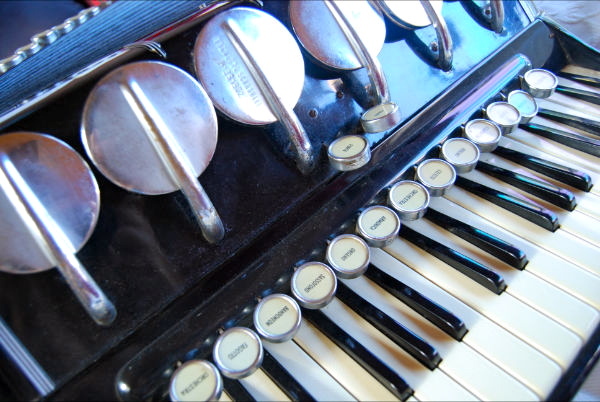 For another ten years the accordion lay once again hidden and forgotten, as the little girl grew up and developed a variety of interests, vagabonded around the world and lived her life. The accordion wondered if this was the beginning of a quiet ending; an ending forever locked inside its case. That all changed on Sunday night. 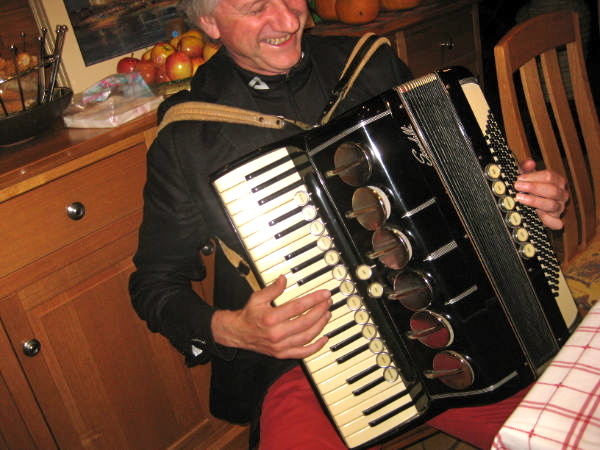 That night during a joyous dinner, the accordion came back to life. The music resonated throughout the house, smiles were brought to the faces of its admirers and the accordion knew its future was once again bright after years in the corner with no one to play. 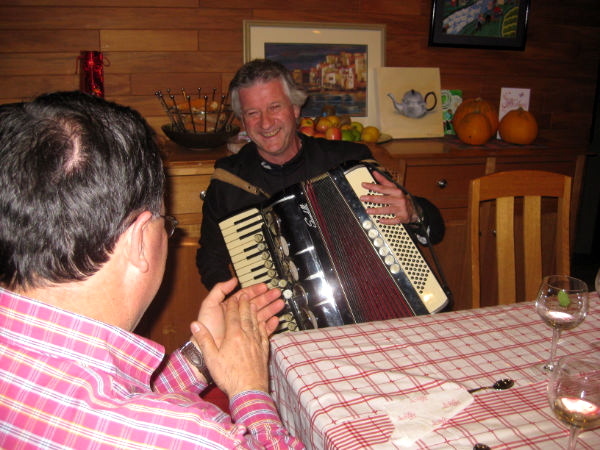 On that night, the accordion sang, and sang, and sang…and it will undoubtedly sing again. Absolutely top stuff ma nin. Yep, was a fun night! That was a great story…loved it. How exhilirating was it hear the accordian played in full flight. Its sound is amazing. The ‘polenta e baccala’ , the ‘gobba tua mare, gobba tua pare’ folk songs (hunch back family song) haha and other italian songs. It was terrific. to know the option is there just in case. Krystina… what a fabulous story. I phoned my Dad after reading this and he has some wonderful memories of when he lived with your Nonna Jack. They shared a bedroom together and Dad said Jack would often play his accordion after dinner. He also told me that your Great Grandfather Giovanni wrote a letter to my Nonno Mario in Italy and asked him to buy an accordion for Jack and when my Dad came to Australia he bought it out with him in 1949. Dad still remembers the make, it’s a Scandalli. He said to treasure it because it’s very special. 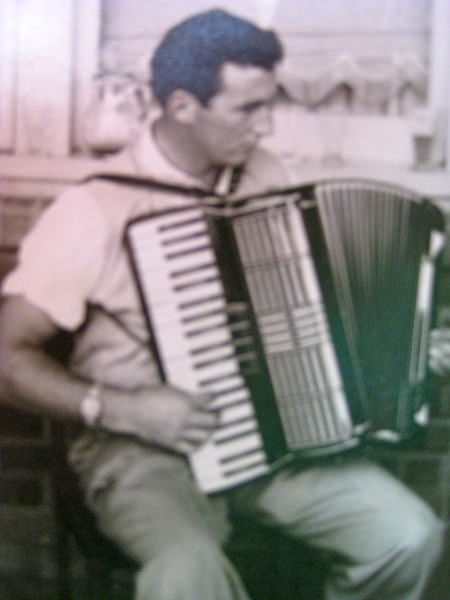 WOW…..
My Dad remembers that Jack had an very old accordion, so this must be the one in the photo. It seems that he owned two. The Scandalli is the one you are writing about. Bruno! Benvenuto al mio blog! Grazie a te per una serata molto divertente. Spero di suonarlo di nuovo la prossima volta che sono a casa! My Friend Brunetto! We spent great summer days and nights together at Rosebud when we were kids! Now I live in Italy. And what a coincidence….I play double bass in a quartet and all the music is based on the beautiful sound of the accordion. p.s. from now on consider me your friend and reader. Your English is great. No need to excuse yourself. How did you come across the “d’accordo with the accordion’ post? Did Bruno send it to you? He is wonderful, even playing at my sister’s wedding most recently! You will have to email me the stories you have. I will send you an email now. Dear Donna del Vino….we all walk along invisible paths and at times they cross! I think I’ll write you an email and tell you a few things of the past. Anyway I hadn’t heard about Bruno since 1990! I would be interested in purchasing this accordion as my father played the exact same one. Would you have any interest in selling it? Thank you for getting in touch. I’m afraid thst Scandallivaccordion is a family treasure and it will not be for sale.